When I was a new teacher, I kept track of grades in a small green gradebook with really tiny columns. If a student wanted to know their grade they had to come meet with me and wait for me to do some math on a really tiny calculator. Mostly they didn't know their grades until I filled in some really tiny bubbles on our grade report forms every six weeks. Ahh, the good old days. Now our district uses an online grade book system that does not give me the luxury of keeping the grades to myself even for a few days. If I enter a score, students and parents can see it immediately, some of them even have alerts on their phones! A teacher I know created an assignment and started entering scores, before she got to the end of the class list, one of the parents had already emailed to ask why her son did not have a score for the assignment. Yeah, it's that crazy. My amazing team of 9th grade English teachers meets twice a week on our common prep period by choice, because we like collaborating and supporting each other. 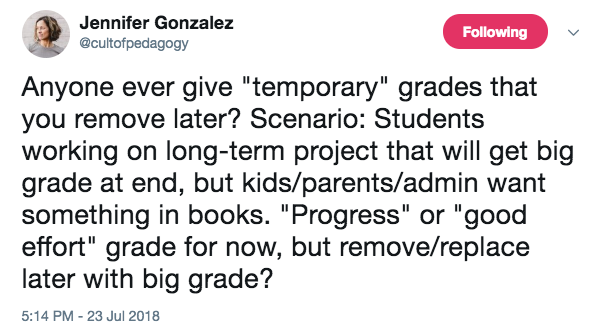 A lot of our conversations are about student work and, by extension: rubrics, grading, re-grading, performance based grading, grade book categories, assignment weights, assignment descriptions, due dates, and the various technical challenges of our online grade book all find their way into those discussions. We've accepted several givens. A. Our very invested parents want to know how their children are doing all the time. (Note that this is not all parents, but we have a lot of very invested parents.) B. We want to make students' overall grades reflective of their performance on the standards for our grade level as much as possible. 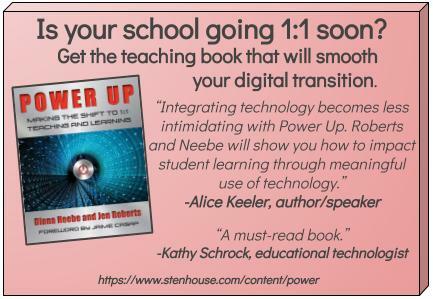 We have to find a balance between giving parents current, accurate, and actionable data, with giving students multiple supports and opportunities to reach mastery. I'd like to stress that these are always ongoing discussions. We are always looking for a better way to balance progress data and summative data in a world where parents and students see every score immediately. This is what we have worked out so far. We use category weights. We reevaluate our percentages every year, but this is what we used last year. The weight of the category has nothing to do with the number of assignments in it. Each semester we had dozens of small assignments in "progress" and only 4-5 in "writing." Summative grades go in reading or writing. The writing category probably gets more attention in our assessment discussions. 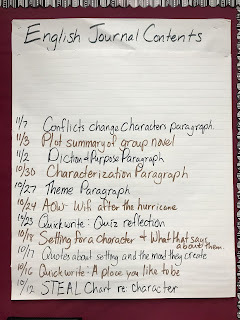 When students finish their writing pieces the score goes in the writing category. That means that sometimes a single essay score is worth more than all the work that lead up to it. I'm okay with that. If all the work we did was leading to excellent writing then the writing is what should count the most. 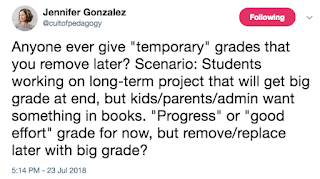 I won't regrade anything in the progress category, partly because I want students to learn that some things are permanent, and because it's not a good use of my time to regrade something that won't have any impact on the overall grade. Besides, if a student had a draft due for writing groups, and he/she did not have that draft in time for writing groups then he/she did not get the feedback from the group. Finishing the draft later is good, but it is too late for the group feedback part. Loosing a few points seems to help students understand that. Finishing a draft on time means you get points and better feedback on your writing. 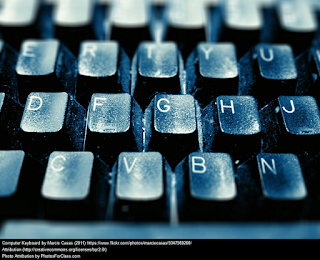 Students can request a regrade on major writing assignments through a "request a regrade" button on our class blog. (You can have a copy of the request a regrade form. The form has saved my sanity. All requests go to a spreadsheet where my co-teacher and I can leave each other notes. Way better than email requests.) My policy has been to re-grade pretty slowly. One, I need to finish grading all the essays for all my classes before I will regrade an essay for anyone. Two, I want students to have to live with their initial score for awhile. This seems to ensure that students won't just turn in poor work expecting a quick regrade when they revise later. I'm also willing to use regrades as a chance to teach my students some manners when needed. A regrade request is a request. When they make that request they are asking me to spend my time looking at their work again. I'm happy to do that because I care about their success, but I expect them to be polite about it. When they aren't we have a private conversation as needed. Expecting that all students who need to revise will take it upon themselves to do so is a fools paradise. My fabulous co-teacher and I spend a lot of time following up with students who need more support to revise and improve their writing. (Many of my students have IEPs and need extra time and support to reach standards.) Re-graded scores replace essay scores in the writing category, and students can request a regrade up until the end of the semester. Please feel free to ask me questions in the comments. As I've said, this is an ongoing conversation with my team, and we'd be interested in your questions and suggestions. Thank you also to Jennifer Gonzalez who asked the question on Twitter that lead to this post, and Emily Guthrie who said she wanted to read it.